Tonight I was watching the Saratoga Yearling Sales Streaming Live from www.fasigtipton.com I have, since childhood wanted to see the sales at Saratoga. Those days I wore a thin path through the commercial carpet in the school library to the shelves that held the collection of books by C.W.Anderson. Weekly I walked over to carefully select a favorite that would be my companion for the week. 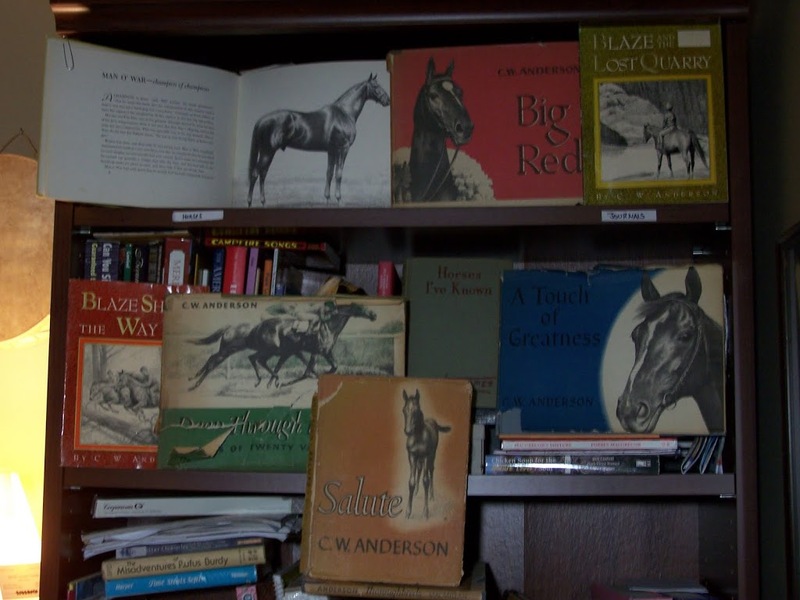 C.W.Anderson wrote so you felt you were right there, including his writing about the yearling sales. His lessons embedded in the text are on grooming, handling, health issues, rearing colts and more, all were taught in a simple natural way. His equine art was exquisite and precise, yet warm and soft on the eye, I was in love! It was the beginning of a new story that continues with a new chapter next weekend. 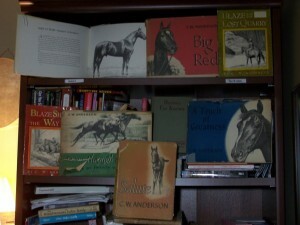 If before I could read I liked horses, once the books were in my hands the love affair began in earnest. I read other authors as well I loved them all. Will James and so many more, if there was a horse or pony on the cover my nose would be buried in it. I read Justin Morgan Had A Horse and that was prophetic. Christmas Day 1974 a black Morgan mare was in the back yard. She was decorated with icicles and happy eating her hay. I didn’t feel the cold or snow and ice I just wanted to stand out there in disbelief that this was MY horse. Cindy was with me from that Christmas Day until 2002, what a gift! A new love affair began with Morgan Horses, which continues today. I leased a look alike mare to my Cindy for breeding purposes, her name was Ryegate Bridget. She is a Lippitt Morgan ( the old blood lines preserved in this group of Morgans) I was hoping for another black mare and she was bred and the long wait ensued. Wait and wait and wait, she drew out the suspense into the 12th month. I was sleeping in the barn my eye easily checking her through a knot hole on the final night. The foal was coming. I ran and got my children we ran into the barn just in time to sit with her and watch the foal enter the world. I got my filly, but as she dried we realized she was bright pumpkin orange. Her color subdued as she shed the foal coat into a lovely chestnut. I gave her the name Storybook Salute Vermont. A homage to her lineage of Vermont Morgans and to C.W.Anderson and my favorite book Salute! This spring Salute ( with new owner Dave Godding [CT] calling her Sally) delivered a beauty of a colt, Hail Vermont. The tradition continues. Last Year at the show they introduced a new drill team this is the video I took of that performance – all Lippitt Morgans! Pinch Me, I think I’m dreaming when I get to be the show announcer and see the beauty and majesty of the Morgan Horse on this historic show grounds where on the perfect day you can hear their ancestors thunder over the Green Mountains and on into greener pastures.